I started by creating a Facebook page that kicked off an entire “movement” to end bullying. This was the day that Carrie and I, along with other authors decided to use our platform as Young Adult authors to actually facilitate change and to be a voice for those kids who cannot speak out or are too afraid to be heard. Megan: Right away, a large number of authors jumped on board with this cause — wanting to be involved in any way possible. The Facebook group grew from 5 to 1500 members in one weekend and is now closing in on nearly 5,000 members. Carrie and I were thrilled when HarperTeen offered to put all of the stories into an anthology. 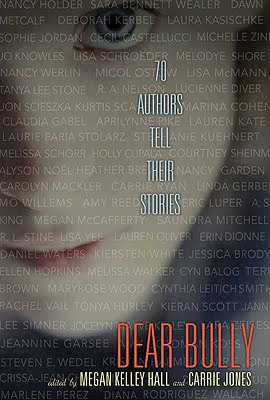 The thought of having 70 authors – well-known, highly successful writers – sharing their personal bullying stories with their fans was something beyond what they had ever hoped for. Megan: The stories come from all angles: from the point of view of the victim, the mother, the friend, the sibling, the classmate – even a few from the actual bully. Some of the stories are light-hearted, while others are raw and emotional. All of them drive home the point that bullying is something that almost everyone has experienced. And while that is a sad fact, they want to prove that it’s not a rite of passage. It doesn’t make you stronger, wiser, or better. But it is something that can be overcome, something that can be changed, something that is relatable, and something that one should never be ashamed of. ‹ Dear Bully: Why Do You Pick On YA Authors?